Mollies belong to the livebearer family of fish. They are also considered by many as a good fish for beginners. In my experience they are hardy little fish which do not cause any fish keeping problems. They can grow to a maximum of 5 inches. Being smallish fish they will happily live in a 60 litre aquarium. They are classed as brackish fish and what makes them really different from other fish is that they can survive in freshwater, brackish and marine environments. Although if you want to change the type water they live in you will need to adjust the amount of salt in the water very gradually to give them time to adjust. To bring the best out in these fish in a freshwater aquarium you could try adding a small amount of salt to the water. However this is only advisable if you are keeping them on their own or with other fish which will tolerate small amounts of salt in their water. Although overall they are hardy, they can be very sensitive to dirty water. So regular water changes and water testing are advisable. They prefer a pH between 7 and 8. They are not fussy eaters and will happily eat flake food. They will also take live food. They can often be seen eating algae off the aquarium glass and plants. If you don’t have any algae in your tank, you can buy algae wafers. Algae wafers are designed for plecs and other Catfish, but all algae eating fish will enjoy them. These fish have developed a bit of a reputation as fin nippers, so it best not to keep them with long finned slow moving fish such as Siamese Fighting Fish. As I’ve already mentioned mollies are livebearers and they breed in the normal livebearer way. The male fertilizes the egg while they are inside the female. The fry grow inside the female, and then the female gives birth to live young. 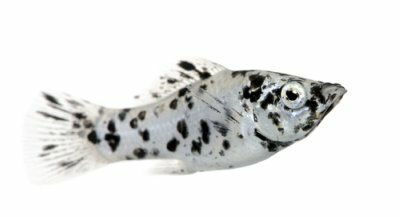 As with Guppies you should keep more females than males if you are keeping both genders together. This is because the males will harass the females to breed non-stop and if there is not enough females they will get tired and die.